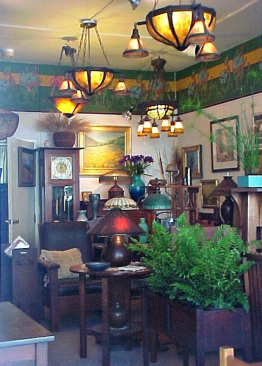 Specializing in Stickley, Limbert, Roycroft, van Erp, Grueby, Newcomb, Rookwood,Handel lamps, plein air paintings, woodblocks, and more; fine examples of the American Arts and Crafts movement 1896-1916. 11 TO 5 AND BY APPOINTMENT. THE DIRK VAN ERP EXHIBITION IN HOLLAND ENDED OCTOBER 28TH. YOU CAN SEE INFORMATION ABOUT IT IN THE ESSAY SECTION ON THIS SITE. IT WAS SPECIAL! The founding brick in the lightwell of the old shop on Neuwestaad. Outside the old shop when van Erp was still apprenticing there. A stroll along this Leeuwarden canal leads one toward the historic location of the Van Erp shop.